Erin Barra instructs Beats by Girlz students in Push and Live. The past five years have seen an explosion in popularity of dance music festivals, in particular in the US. Go to any festival, however, and you’re likely to notice a heavy bias towards male performers. Drawing from her experience as a female electronic and pop musician, New York-based Erin Barra started Beats by Girlz, a series of production and recording classes for women, offered at the Lower Eastside Girls Club. We spoke to Erin about the project, and how it relates to her own music and experiences. How did your personal experience as a female musician inform your approach to Beats by Girlz? I've always received feedback from fellow females telling me that they like learning from me because I'm a woman, that they feel comfortable and finally feel like they’re being understood. I think it's hard for most women to comfortably learn in an environment where they're surrounded by men and even more so when you're dealing with young adults and teens. I used my experience as a women in music technology to create educational content and situations that were female powered and centric, which I think is the key. The fact that it's being taught from one woman to another and the support it provides makes a huge difference. Erin Barra works with the Beats by Girlz students. 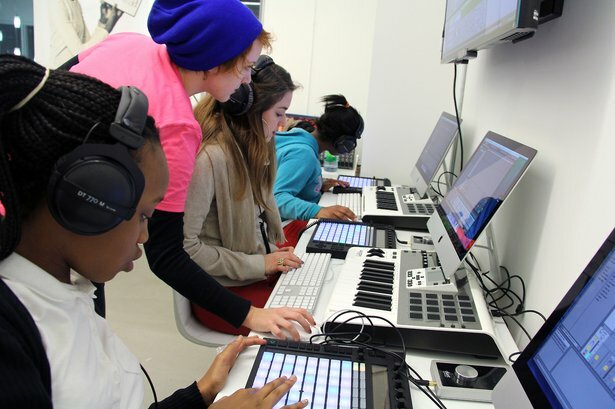 What do you think the music technology community can do to address the gender imbalance? The issue is complex and has a lot to do with how our culture evolves (...slowly). But I think a good start would be to create more content which represents women, is geared towards educating women and marketed towards them. Additionally, there are too few females in the spotlight and I think if more of us had the opportunity to shine, other women would aspire to that same brightness. How did you start Beats by Girlz? Beats By Girlz started as an idea I had during a meeting in October of 2013. I had just finished my third studio album as a recording artist but my career was rapidly moving to the other side of the glass without much effort or consent on my part. Since things were organically headed in a new direction, when it came time to release the music I wanted it to be less about me and more about the community at large. I decided to sell the record in order to raise money to make Beats By Girlz a reality. Before we even finished the fundraising campaign we already had an organization (The Lower Eastside Girls Club) that wanted to incubate us. In a lot of ways it's been a fairytale story and one that unfolded quickly, made possible by the charity and support of many many people. 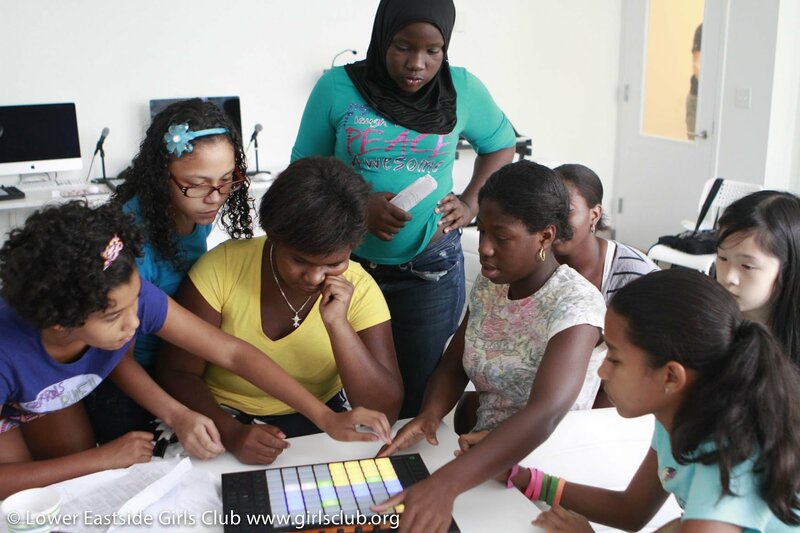 What does Beats by Girlz offer for students that’s different from other educational programs? My approach to electronic music production is more about getting women's hands on the technology and having fun in the first 5 minutes of class, rather than going into the technical aspects. It's like playing guitar; you put your hands in the right places and you're making music right offthe bat which means you're enjoying yourself and makes you want to continue. A lot of the technical information and understanding will come later over time but I think it's vitally important to get people to discover how much fun and easy making music with a computer really can be. Mostly people learn by doing anyway, so if it's communicated as something enjoyable and stress free, they will want to do it more, which ultimately results in more learning. Beats by Girlz class exploring Push together. You’ve been through the music tech learning process and forged a successful career on the other side. What’s your advice for women who are starting out, or are interested in this kind of career but don’t know how to approach it? It's important to find or create a learning situation that's going to make you feel comfortable. If being in a class full of guys makes you feel like an outsider, than maybe try an online course or teaching yourself via Google/YouTube. If possible, search out other women who are at a level you aspire to and ask for mentorship. Women naturally are caretakers and invest in others, so when you ask them for help 99% of the time they'll provide support. To be honest, when I look back on my career I never remember making a distinction between me and my male peers. I actively didn't perceive my gender as a handicap and so I guess it never really was. Perspective is everything, there. Bottom line, the best way to learn is by doing, so the best advice I could provide to anyone, male or female, is just to put in the work and stay true to what it is that compels you to make music. I believe that if you can manage that, success will find you, regardless of gender.